Ahlan wa sahlan! Aki & Nevine reporting from Cairo! Since the 2011 revolution there have been many periodical violent upheavals in Egypt. During the past two years most of the news broadcast about Egypt abroad was mainly about demonstrations, clashes, sit-ins and the military coup d’état. To anybody following the news it must seem like Egypt is a very dangerous place to be in right now. In fact, there are uneventful intervals of peace and calm which usually last only 3 months. However, people cannot live cooped up in their homes all the time so they try to live their daily lives as normally as possible while navigating the turbulence affecting their routines. Our Office is located near Tahrir Square, so whenever there are any disturbances in the area we have to close the office. However, we immediately take advantage of the calm intervals to hold our events in which many people do participate. This time we would like to introduce you the two of our events related to manga and anime. Even in the Middle East, and especially in Egypt, Japanese pop culture, anime and manga are very popular. Recently, young people want not only to watch anime and read manga, but also to get together with their friends to share their passion for manga and anime, draw manga and illustrations, sing their favourite anime and J-pop songs, and do cosplay. 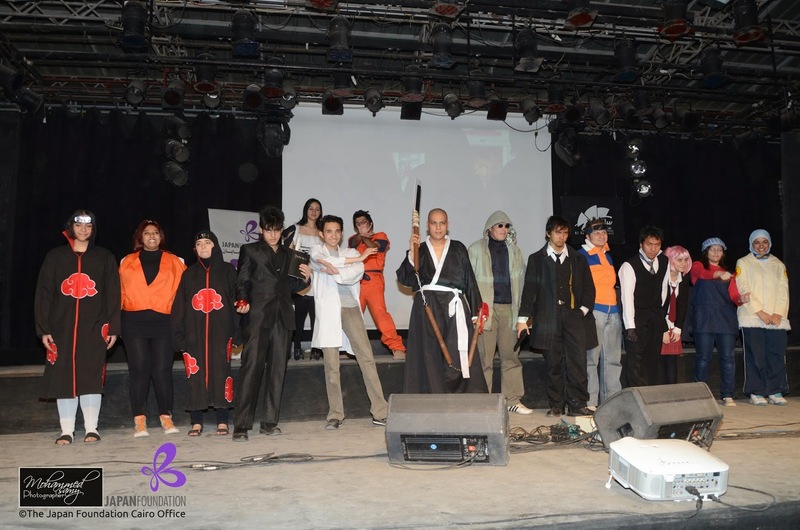 Believing that they needed to have a platform to fully express this passion, the Japan Foundation Cairo Office organized the first anime and manga event in Egypt, at El Sawy Culturewheel in Zamalek on March 8 and 9, 2013. Standing at the entrance to welcome all visitors was a 6 meter-tall Grendizer balloon brought to Egypt specifically for this purpose from the Go Nagai Memorial Hall in Wajima City. Grendizer had also participated last year in the Baghdad International Trade Fair, where it received favorable attention. Our event included many attractive sections. For example, an exhibition for works by the members of the Egy-Manga group who plan on becoming professional manga-ka, and a manga-portrait section by the young manga artist “Wahba.” What’s more, we had a Manga Café where visitors could read manga magazines, comics, Arabic translations of Japanese books, as well as a Cosplay experience section where special costumes could be borrowed, a section for writing messages to Japan on a big banner, and an origami and Japanese calligraphy section. There were more than 800 visitors, and the event was very lively and became an enjoyable cultural festival. Visitors enjoyed their first "cosplay"
In the afternoon we had the Cosplay Show. Over 30 Egyptian participants dressed up as their favourite characters from anime and manga series such as Bleach, Death Note and Naruto, and went on stage to display their costumes. At first they were a little shy but as the crowd cheered them on, they got over their shyness and started posing as the characters. Even after the Show ended, the cosplayers were surrounded by fans wanting to take pictures with them. Next, we had the J-Pop Singing Contest in honour of anime song singer Hironobu Kageyama, who served as one of the jury members. 10 bands/ soloists of a total of 32 singers passed the preliminary stage and participated in the live competition. They all performed their favourite Japanese songs with great enthusiasm. 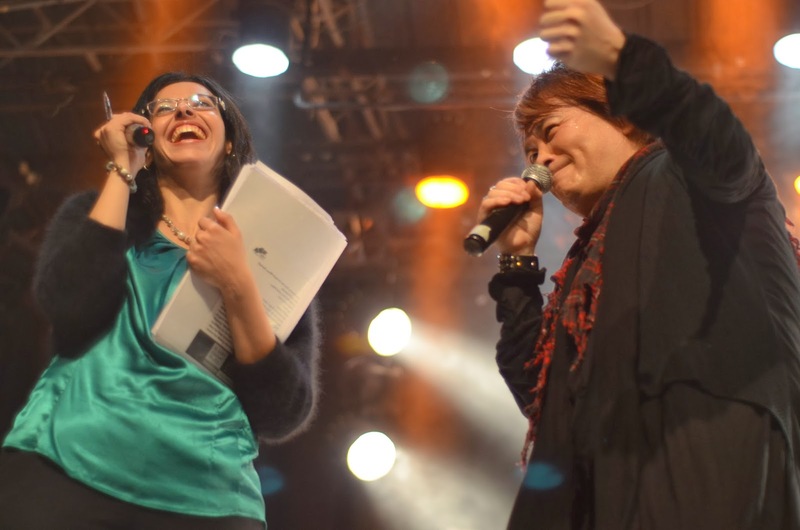 The first place winner was Laila Iijima who both sang and danced to the music of “Luka Luka Night Fever.” The Kageyama Prize was awarded to the band consisting of 10 students from the Japanese Language Department of Ain Shams University. They performed the theme song “Manazashi” from the TV drama series Tumbling. The Japan Foundation Special Prize was awarded to Ms. Ramza, a high school student with the exceptional voice, who wants to become a voice actress in future. She sang “Michi ~ to you all~” from the anime series Naruto Shippuden. "Ram chan," who wants to be a voice actress, sang "Manazashi"
On March 9, Kageyama-san, Grendizer and the Egyptian cosplayers went to the Pyramids, carrying the banner with all the messages written by Egyptians to Japan and had a photo session. In the afternoon Kageyama-san headed back to El Sawy Culturewheel for a talk about Japanese anime songs. All in all, it was a lovely day full of lively interaction between Kageyama-san and the Egyptian anime and manga fans. Unfortunately, at that time there were many riots all over Egypt related to the the Port Said Stadium violence trial, and so there wasn’t much press coverage for our Festival and other events. Nevertheless, it seems the event left a deep impression on the fans: After the event, the young manga-ka have been issuing their own magazine and organizing exhibitions, and anime lovers just got started to prepare for the holding of an anime event called EGCON. The young Egyptians who want to become professional manga-ka are very good at drawing, but when it comes to making up a complete story, there are few who can do it. Many seem frustrated because they try to write a long manga story but fail. So we thought about providing a chance for them to train through making up a manga with only four frames. 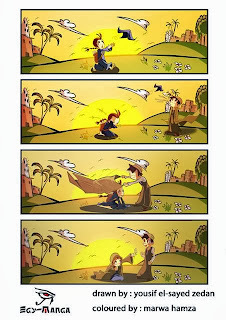 Accordingly, last summer we organized a four-frame manga contest with one of the following themes: exams, love or failure. We had over 30 entries, and after choosing the best 10 works we sent them to Professor Yoshiro Iwami, associate professor in the Manga Department of Kyoto Seika University to receive his remarks on the works. The genres included science fiction and romance, but the number of humorous manga submitted by the joke-loving Egyptians was surprisingly few. Despite their popularity in overseas countries, it also seems that the participants were not very interested in the “Arabic style” per the Arabian Nights or in Ancient Egypt either, and so these themes were not present in the submitted works. We look forward to finding out what type of manga will be coming out of Egypt in the future. I'm terribly sorry for butting in with my submission.